Platters of raw ingredients surround large pots of broth, bubbling on the tables. There’s way too much food—meats, seafood, vegetables, tofu, dumplings—and we have to set up small folding tables to hold it all. Family and friends huddle around the pots, no elbow room to spare, swishing wire skimmers filled with food through the broth. Every now and then, mah-jongg tiles crash in the background as people break from eating to play. My family is from Hong Kong and Shanghai, but settled in Los Angeles before I was born, and the Lunar New Year of my childhood meant a house decorated in red (for happiness) and gold (for wealth), with bowls of kumquats and mandarin oranges (more good fortune). And it always meant hot pot. We’d have a Cantonese-style chicken-bone broth and a deep-red, fiery Sichuan pork broth that made me sweat just looking at it. There was plenty of thinly sliced rib-eye beef and lots of seafood. We’d head out in the morning to the Chinese market in search of the freshest sea creatures available, some of them still wiggling around—lobster, Dungeness crab, and fish straight from the tanks, plus scallops, Manila and geoduck clams, abalone, and head-on shrimp. At around noon, friends and extended family would arrive, often with even more food. We’d divide and conquer: one person washed greens, another chopped vegetables, and a few others set up the platters of sliced meats, tofu, and seafood. I’d stand at the kitchen counter with the other kids, learning how to wrap dumplings. Our celebration belongs to a tradition dating back thousands of years, most likely to Mongolia. From there, hot pot spread throughout East Asia, where it’s known under many names and in many regional variations: firepot, steamboat, jim jum (Thailand), shabu-shabu (Japan), lau (Vietnam)—all delicious, and cooked not just for the Lunar New Year but for birthdays and other celebrations too. 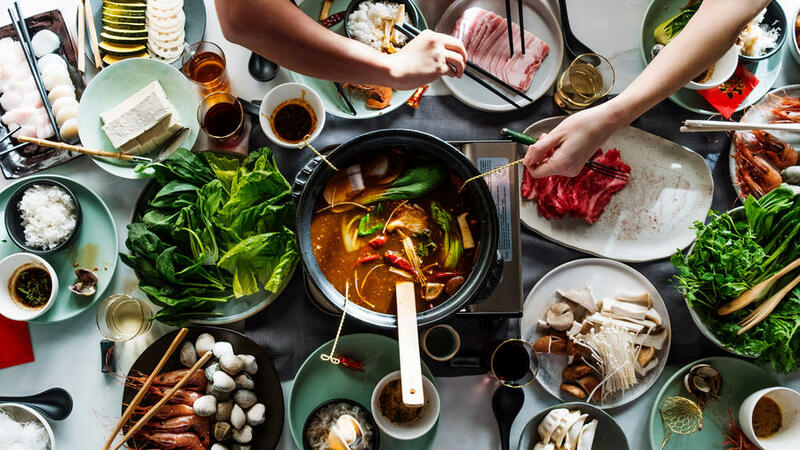 Hot pot can vary from home to home and person to person, with traditions sometimes fusing to make it all the more interesting. I know a couple who are both first-generation Cantonese but grew up with vastly different hot pots. The wife knew hot pot as centered around chicken, dipped in soy sauce. Her husband grew up on broth made from pork bones, and cooked lamb and beef in his hot pot. Their solution? A pot with a built-in broth divider. As I’ve grown, I’ve had hot pots that reflect whoever’s at the table. Since my girlfriend is Japanese, our simple hot pot often includes dashi broth with kombu (edible kelp). I’ve seen hot pots that are all meat or all vegetables or a mix of both with seafood, or that focus on the seasons: kabocha squash in winter, heirloom tomatoes and cut-up corncobs in the summer. All kinds of broths work, too, from a simple chicken stock to spicy Thai-style coconut-rich tom ka broth. Basically, there’s really no right or wrong way to do it. In my memory, and still today, hot pot night goes on for hours. The hungry chaos of baskets lowering into boiling broth, the lost dumplings, the escaped shrimp—all of it settles into a leisurely grazing process. As the night winds down and the platters empty, we end with noodles, topped with ladlefuls from the pots, now ­layered with flavors from everyone at the table. Just as cooking, laughter, and conversation have brought the tribe together, so do these final bowls of communally seasoned broth. Use this handy Asian Market Shopping Guide to source your ingredients.